MOROCCAN RAILWAY - railmeds JimdoPage! The transport sector provides in average 7% of the GDP. It directly employs 6% of the labor force, contributes about 15% of the State budget revenues and uses 40% of the national energy consumption. Depending on the year, it absorbs between 20 and 25% of the State investment’s general budget. - It covers more than 57,000 km among which 32 100 and about 800 km of highways including 6,000 structures 56% of which are bridges and 36% are box culverts. km of coast on the Atlantic Ocean and the Mediterranean Sea and handling an annual traffic of about 60 million tons of goods and the transport of the millions of people. the Ministry of Equipment and Transport (MET) which is the main body in charge of the administration and legislation design. contracting, monitoring works and paying amounts due to contractors. Its mission is supported by FSR. _ The Road Transportation Department (DTR) in charge of the administration of road transport activities. It includes two divisions, the Studies and Regulation Division and the Transportation Division. _ The Department of the Road Transportation Safety (DSRT), in charge of the safety of road transports, the safety of vehicles and driving (driving licenses). It manages the technical control of vehicles and the training of drivers. _ The Department of Studies, Planning and Coordination (DEPC) in charge of the transport sector’s information system, the planning and development of the sector and coordination between transportation modes. The Moroccan railways network covers 1,907 km including 1,537 single track lines (80%), 370 km double tracks (20%), 528 km service tracks and 201 km special connection lines from the national railway network to various companies. 53% of the network’s total length, or 1,003 km, is electrified with the continuous 3,000 Volts, while 904 km are diesel traction operated. The Moroccan rail network can accommodate 160 km/h speeds. This network serves the Kingdom’s major cities and main ports, with the exception of Agadir in the south and Nador in the north. August 6, 1963. It is a public institution with industrial and commercial vocations, holding moral entity and financial autonomy. trains daily serving 101 stations throughout the total network. _ Restructuring phase: ranging between 1994 and 2001, and was marked by the launch of an important restructuring and reorganization program to face a crisis situation that almost jeopardized the Office sustainability. Outcome: recovery of situation combined with rehabilitation operations of the production system. designed worth of 1.65 billion Euros aiming at extending the network, increasing its capacity and improving railway services. ONCF’s internal organization was mainly based on the technical railways operation, mainly infrastructure, equipment, operation, commercial activities and the financial and administrative services. - To create the Moroccan Railways Company (SMCF), replacing the National Railways Office. - Enhancing efficiency, autonomous management, SMCF competitiveness and its market-oriented strategy. Reforms reduced the staff size and hence reduce costs. The number of employees dropped from 14,000 agents in 1995 to 8,960 agents at the end of 2005. _ Disengagement from related activities to better focus on business core activities. confirm encouraging results, while playing an essential role in vitalizing the country’s socioeconomic activity. It operates at the level of the passengers market as well as of freight, and leads the sector’s structured companies in 2008 with about 28 million passengers and 32 million tons of freight. cereal sectors. Besides, the integrated service policy that will be deployed, mainly thanks to the logistical platforms network to be set up throughout the Kingdom’s main cities, will secure customers’ loyalty and offer the possibility to reach to other segments previously ignoring railways. An important action plan has been elaborated to reinforce and develop the freight activity. Regional projects launched in this framework include the Maghreb-Europe “Freight Corridor”, which is the expression of an outspoken agreement where railway networks in Maghreb countries ally together to create the direct Trans-Maghreb connection for freight. _ The rapid conveyance of goods. _ Creation of the single window. 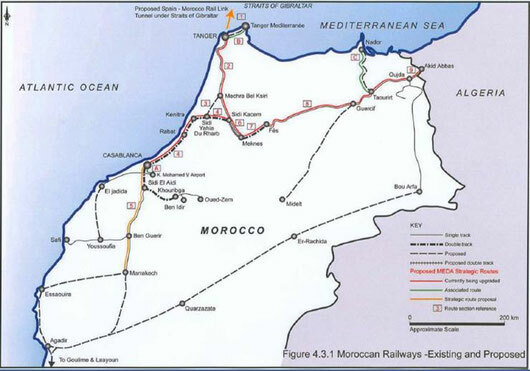 As for the project evolution, and according to orientations of the Maghrebi Railways Transportation Committee (CTFM) and to recommendations of UIC’s World Exclusive Council which hopes to lay the first milestone towards the development of railways in the Maghreb region, a pre-study was recently conducted, mainly focusing on railways in the Maghreb area (North Western Africa) and the exploration of new opportunities. Efforts are currently made by the Tunisian part in order to find resources required for the project and the situation will be presented in the framework of CTFM’s next meeting to be held in Libya. subsequent budget of 1.65 billion Euros has been assigned. This program includes several types of large scope operations, aiming at the construction of a modern and more efficient network railway, a vital lever in the country’s socioeconomic take-off. _ Modernization and construction of railway stations according to a program concerning forty stations providing them with modern architectural style and transforming them into real multifunctional and multi-service exchange and meeting areas. combined with a shortcut (Sidi Yahia-Macherâa Bel Ksir: 50 km) and the electrification of this line (1:30 h time saving between Casablanca and Tangier). _ Continuity of the modernization program and the construction of railway stations based on a new valorizing concept as multi-service and multi-functional terminals. _ Reinforcement of the “phosphate” logistics to support OCP holding in its development policy, by providing it with the necessary logistics and fulfilling its needs. Technical specifications used by ONCF for the infrastructure, the rolling stock and maintenance, are based on UIC standards, EN standards, ORE (environment), ISO standards and CEI standards. _ Highway bridges: 105 of a total length of 2,152 lm. _ 10 PAI (computer switching stations). Maintenance: performed according to annual and five-year long programs. Departments in the definition of the main safety improvement orientations. _ Safety of ONCF’s personnel and employees.